The clues were there, all the way back in 2015. Jared Leto stepped onto the Oscars red carpet in that lavender Givenchy tux, and say what you want about his Joker, but that outfit was a vision. Then, last summer Chance The Rapper posted up in his signature ‘3’ cap and a lavender t-shirt from Play by Comme Des Garçons in the joyfully goofy “No Brainer” music video with DJ Khaled and Justin Bieber. It was *chefs kiss* perfection. There’s really nothing quite so affecting as a guy who looks totally at ease in a traditionally feminine color like lavender. (It took adding the word “millennial” to its name, but think of how normal it feels these days to wear pink!) It’s why Jared Leto looked like an absolute smokeshow in that pale purple tux, and why you can’t help but feel happy seeing Chance in that tee. These guys know how to make lavender look as at home in a guy’s wardrobe as a light blue oxford button-down—and you can, too. From light purple kicks to the grooviest short-sleeve shirt, here are eight easy, stylish ways to work a little lavender into your closet this spring. Unfamiliar colors are easiest to wear when strategically positioned on an item that’s just incredible comfortable. J.Crew’s classic pocket tee is the perfect baby step for anyone looking to ease their way into the pastel menswear trend. Nothing is more deluxe than a really expensive sweatshirt, right? So it might as well be memorable—like this heathered logo crewneck from A.P.C. that will look right at home everywhere from the corner coffee shop to The Cape. Speaking of bougie… Why not just take a page directly out of Chance The Rapper’s book? Yes, paying almost a hundred bucks for a tee can feel almost comically outrageous, but think how often you wear a wardrobe staple like a crewneck t-shirt. It’s a classic piece you’ll have in your rotation for years to come, especially when the quality is high. If SG ruled the world, every man would wear short-sleeve button up shirts exclusively from May ‘til September. Help our cause, won’t you? Because hand to god, this low-key printed RVCA shirt is the stuff late spring date night dreams are made of. What’s old is new again, and this Polo hat that gives off major early aughts middle school flashbacks, which somehow feels totally right for 2019. Bonobos does basics really well. We know this. But their sleeper hits are often unexpected outerwear pieces like this lavender denim cargo jacket. Throw it on over a white henley and your favorite jeans for an unexpectedly crispy spring look. Who, us? Talking about the Vans Old Skool again? Whatever—this pinky-purple canvas version feels like a fun subversion of the classic colorways and I think you should wear them with everything—especially slim khaki chinos and a grey sweatshirt. 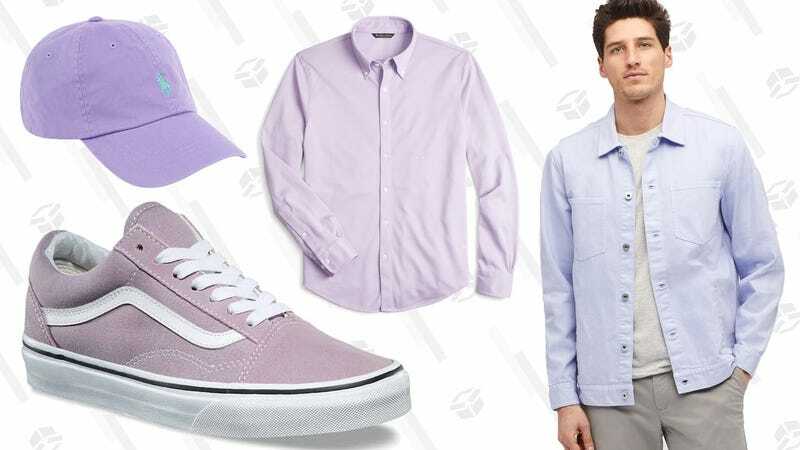 For spring and summer weddings—or hell, just a dressy day at the office—try pairing a breezy lavender button-down with a floral or navy-and-white striped tie. Your boss will be jealous, I promise.